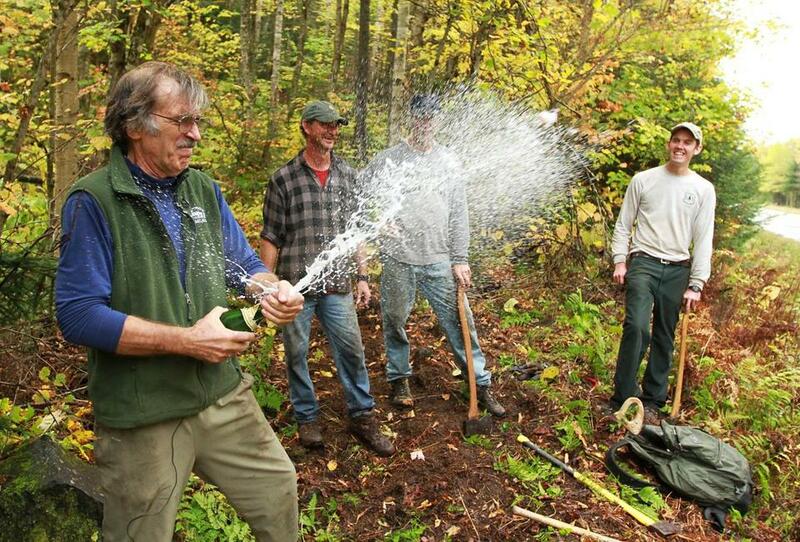 Kim Nilsen, the architect of the Cohos Trail, uncorked a bottle of champagne to celebrate its completion two weeks ago. PITTSBURG, N.H. - In 1978, a young newspaper reporter in northernmost New Hampshire wrote an editorial calling for the creation of a grand hiking trail spanning the length of Coos County, from the White Mountains in the south to the Canadian border. The young man, Kim Nilsen, dreamed of opening this remote part of New England, dense with natural wonders but scant on people, to new eyes. His plan was bold. It was sweeping. And it elicited absolutely no response. So he set out to build it himself. Two weeks ago, under a misty fall sky just a few miles from the Quebec border, Nilsen, now 63, finished his 162-mile trail. It had only taken 33 years. As the last maple sapling was cut, Nilsen produced a bottle of champagne and addressed the small group of volunteers who had come out to help clear the final mile of what he has named the Cohos Trail. “This is cheap champagne for a cheap organization,’’ Nilsen said with a big smile as a blast of bubbly splattered onto the autumn leaves around him. And with that, his “ridiculous, foolish’’ idea had finally come to fruition, though it is much more than a personal accomplishment. The Cohos Trail is the largest trail system to be built in the northeast in generations, and it becomes the third long-distance trail in New England, alongside the Appalachian Trail and Vermont’s Long Trail. It is already attracting followers because it offers something those popular trails do not: solitude. Kim Nilsen (right) and Yvan Guay worked with a team last month cutting the last two-fifths of a mile of the Cohos Trail. 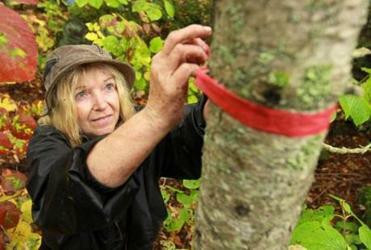 Sue Kenn, who was the first person to “through-hike’’ the entire trail a few years ago - she bushwhacked the sections that had yet to be cut - said it was an entirely different experience than when she hiked the 2,200-mile Appalachian Trail. In many ways, that solitude is what inspired the idea in the first place. When he was alone, really alone, Nilsen said he would experience something he calls “continental silence,’’ where “all you can hear is your own blood circulating.’’ If he could create a hiking trail that threaded over the higher ground along that spine, Nilsen believed, he could lead people to similar experiences. Kim Nilsen credits Lainie Castine (above) with motivating him to continue and taking on much of the work, especially the last bits of trailblazing. What he began, he says, she finished. But his initial editorial went nowhere, and eventually Nilsen and his family moved down to Keene, in the southern part of the state. He went into the natural foods business and later became a caretaker for severely developmentally disabled young people, but he was never able to shake the idea for the Cohos Trail. Fifteen years ago, during a rainy family vacation in Maine, he took out his maps again and vowed he was finally going to do something with his idea. He organized a public meeting in Lancaster, and when 55 people came out for it, he says he “finally felt comfortable with the idea.’’ Thus began the great quest, and great headache, of his life. The state told him if he could pull it off on his own, they would support the idea, and twelve years ago Nilsen and a small group of volunteers finally began to cut the Cohos Trail. Much of it was new territory, but much of it involved connecting to existing trails throughout the county, including a large stretch in the White Mountain National Forest, where new trails are not permitted. 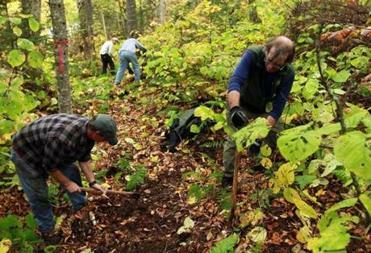 The trail begins in Crawford Notch and slowly snakes its way through Coos County, which is about the size of Rhode Island, before hitting the Canadian border, where it joins with a Quebec trail system that leads to Mont Megantic. Along the way it passes over 30 mountain peaks, including four 4,000-footers, all while never encountering a town with more than 900 people. At the moment there are three shelters, but plans call for nearly 10 more with the goal of allowing through-hikers to travel without the need of a tent. Clearing the actual trail turned out to be the easy part, he said; if that had been the only task, “we would have been done a long time a go.’’ Instead, the process of negotiating for permission with the various landowners - particularly timber companies - not to mention endless process of networking and herding volunteers to maintain the trails they had already cut, wore him down. Five years ago, he announced that he was quitting on his idea, and shut down the Cohos Trail Association. He credits Lainie Castine, a devout hiker who lives in Pittsburg, near the northern terminus of the trail, with motivating him to continue and taking on much of the work, especially the last bits of trailblazing. What he began, he says, she finished. And quickly, her statement was confirmed as Nilsen and three men came behind with chainsaws and loppers and handsaws and quickly carved a clear path. With the Cohos Trail finally complete, and his 30-plus year odyssey over, Nilsen took a moment to reflect on what he had done. Of course, as the trail grows in popularity, it will eat away at the solitude, but Nielsen said that for the time being at least, that’s not a huge concern.